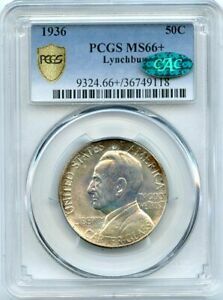 The year 1936 was the high water mark for United States commemorative coins, both in terms of their speculative popularity and in the number of different types issued. 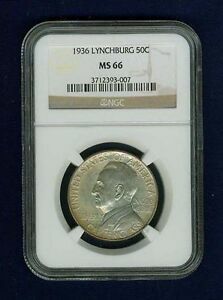 Some marked events of national significance, while others were of purely local or regional interest, coins which were authorized primarily as the result of some senator's or congressman's negotiating skills. 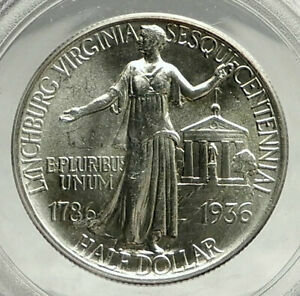 Within the latter category is the half dollar honoring the sesquicentennial, or 150th anniversary of Lynchburg, Virginia. The city of Lynchburg, though it has figured at times in the history of the United States, has never been of great importance to the nation as a whole. Chartered by the Virginia Assembly in October of 1786, it derived its name from John Lynch, who owned a farm named Chestnut Hill and on whose land the town was built. Some 45 acres near Lynch's Ferry were procured and placed under the control of ten trustees, who were responsible for the laying out of lots and streets. Located in the foothills of the Blue Ridge Mountains near the geographical center of Virginia, Lynchburg's principal role was as a shipping port. Its site on the James River made it ideal for barging tobacco and other agricultural products down river to Richmond from the interior. Lynchburg was incorporated as a town in 1805 and as a city in 1852. A supply base for the Confederacy during the Civil War, Lynchburg became the subject of an attempted seizure by Union General David Stone in 1864. A successful counterattack by CSA General Jubal Early ended Northern interest in Lynchburg, but by then the fall of Richmond itself was imminent. Tobacco remains the primary business in Lynchburg, though other industries of the 20th Century have included the manufacture of shoes and textiles, as well as the production of fertilizer, flour and paper. 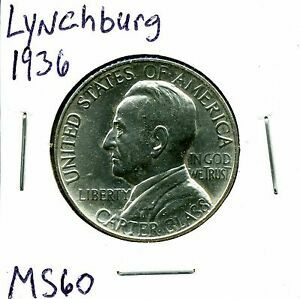 The impetus for seeking a commemorative coin honoring the sesquicentennial of Lynchburg's chartering in 1936 seems to have been simply local pride. The city held an anniversary celebration October 12-16, and though not specified, it's likely that the profits derived from coin sales were intended to help defray the expenses of this event. 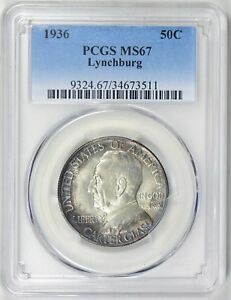 The Lynchburg Half Dollar legislation evidently breezed through a Congress already numbed by a flurry of commemorative coin bills, and it was passed on May 28, 1936. 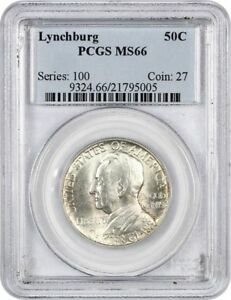 This law authorized the minting of up to 20,000 pieces, which were to be coined with a single design and at a single mint. These last two provisions were in response to the abuses of other coin programs in which numerous date/mint combinations of a single type had frustrated collectors. Unlike many such committees, the Lynchburg Sesqui-Centennial Association did not furnish its own unworkable designs to the Mint, but rather sought a sculptor who could devise suitable images himself. Responding to an inquiry from the association's secretary, Fred McWane, Fine Arts Commission Chairman Charles Moore advised McWane that it had proved more successful when the commission selected the appropriate designs itself and then chose a sculptor to model them. Moore suggested that the obverse of the Lynchburg coin portray John Lynch and that its reverse read "To commemorate the 150th anniversary of Lynchburg by Act of Assembly . . . 1786." In his reply to Moore, Secretary McWane reported with regret that "There is no existing portrait of John Lynch." He added that "Several other names have been suggested for the coin." For the coin's reverse, McWane advised that "we would probably want the Memorial [Monument] Terrace in Lynchburg . . . This is the most characteristic thing in Lynchburg and for many years was the first sight that greeted visitors as they came into the city from the Union Station." He closed with an expression of surprise at Moore's revelation that a competent sculptor would cost $1,000. 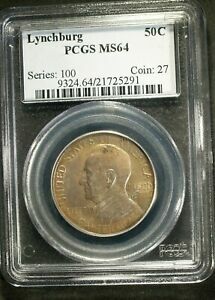 Its shock notwithstanding, the association considered hiring either Charles Keck or John C. Brcin to design and model the coin. Moore advised in favor of Keck, who had already proved his worth in creating the Panama-Pacific Gold Dollar of 1915 and the Vermont Half Dollar of 1927. With no likeness of Lynch from which to work, Keck was advised to prepare a portrait of Lynchburg native Carter Glass, who was then serving as one of Virginia's United States senators. Glass, who was already 78 at the time, had been named honorary chairman of the Sesqui-Centennial Association. 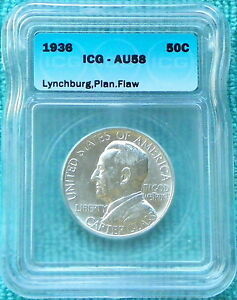 Though he protested the placing of his portrait on Lynchburg's coin, Glass was outvoted by his admirers. 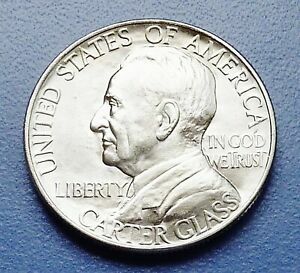 The reverse of this issue featured a standing figure of Liberty in modern dress. In the background was placed Lynchburg's Monument Terrace, with its Confederate Memorial, and also the Old Lynchburg Courthouse. The Commission of Fine Arts approved Keck's models on July 29, 1936. 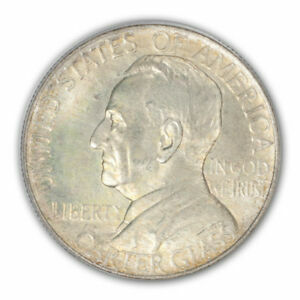 The Philadelphia Mint struck 20,013 pieces in September (the odd 13 coins were reserved for assay), and this issue went on sale beginning the 21st of that month. 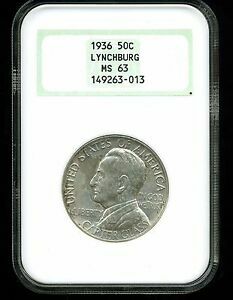 Offered by the Lynchburg Sesqui-Centennial Association for one dollar (plus 25 cents for mail orders), they sold out almost immediately. Accounts are in conflict as to whether any were still available at the time of the anniversary celebration in Lynchburg, October 12-16. 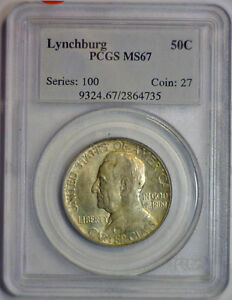 Because of its limited mintage and apparently wide distribution, Lynchburg Half Dollars have never been found in large quantities on the coin market. 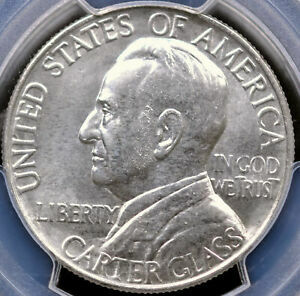 Examples are typically encountered one or two at a time, and they seem to be even scarcer than their low mintage implies. 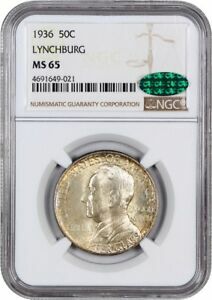 When found, however, Lynchburg Halves are nearly always in mint state, reflecting the fact that most went directly to collectors rather than the general public. Many have been abused through cleaning or other forms of mishandling, yet specimens may be found in all grades from MS-60 through MS-64, less often in grades MS-65 and higher. 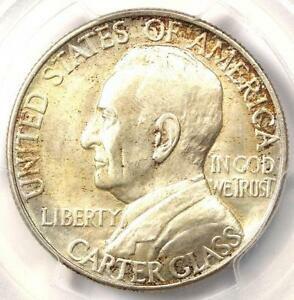 The typical Lynchburg Half Dollar has satiny surfaces, with the reverse occasionally appearing semi-prooflike. 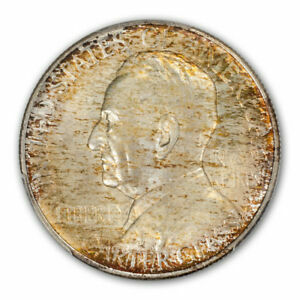 This issue is often found not fully struck, the highpoints of its design looking grainy as the result of planchet's natural texture still being in evidence. By not filling the dies, this texture was left intact. Areas in which to look for weakness are Liberty's head and her thigh, near the motto E PLURIBUS UNUM. Wear, if any, will first appear on the senator's hair above his ear, also on Liberty's head and chest. 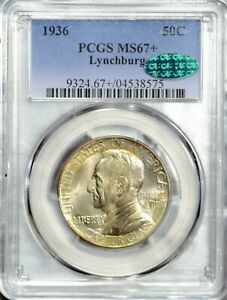 The Lynchburg Half Dollar was distributed in a buff-colored cardboard folder. 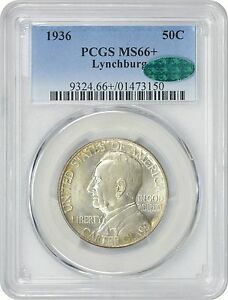 Its front cover is dated October 12-16, 1936 and carries the inscription LYNCHBURG IN OLD VIRGINIA IS CELEBRATING ITS 150TH BIRTHDAY WITH THE ISSUANCE OF THIS COMMEMORATIVE HALF DOLLAR AND PAGEANTS, BOOKLETS, MUSEUM, ART EXHIBIT AND EXHIBITION. The second and fourth pages of this folder are blank, while the third page contains five holes for storing up to that many coins. This original folder is highly prized by commemorative coin collectors, especially when housed in its mailing envelope.